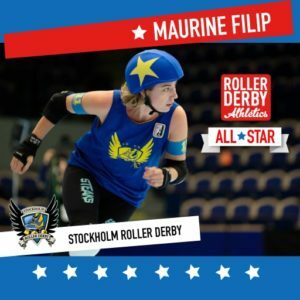 Besides being a very slippery jammer for STRD, Maurine is such a positive ambassador for European Roller Derby that she is a sponsor / spokesskater (I just made up that term) for no less than five derby brands, including Cheezeballs Bearings, SISU mouthguards, S1 Helmets, STEAKS protective clothing, and obviously, Roller Derby Athletics! You can follow Maurine’s comings and goings on Instagram. What do you get up to when you’re not playing derby? I’m a psychologist who loves to travel, try new things, meet fun and interesting people, and in general keep growing as a person. What are you working towards in derby right now? We’re just coming out of a well deserved off-season following the 2017 WFTDA playoffs tournament in Malmö. I’ve used this time to focus on strength training, mental training, and footage analysis to plan my focus for the upcoming season. Any big successes or milestones for you in derby recently? 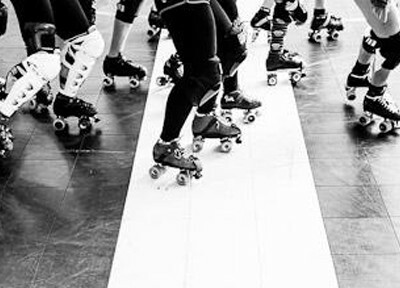 Apart from our huge USA road trip, and participating in the first ever WFTDA Playoffs tournament outside of North America, my most memorable moments this year have been off skates. I got to speak organizational psychology with leagues all over Europe at EROC in Berlin (European Roller Derby Organizational Conference), and sports psychology at Euro Derby Con in Barcelona. I’ve been selected onto the board of the Swedish Skating Association and get to be a part of developing derby nationally. I’ve also had the pleasure to coach leagues and individual skaters all over Europe both physically and mentally, and when they succeed, that’s my success as well! 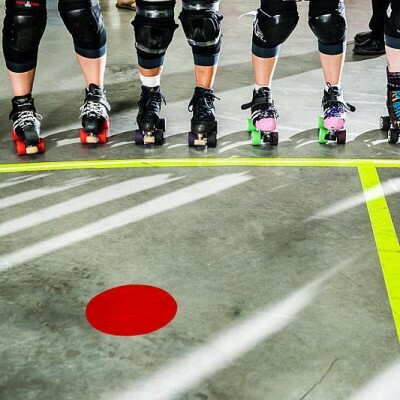 How has off-skate training contributed to your derby experience? Working on strength, cardio, explosiveness, and agility off-skates allows me to focus all my effort on technique and tactics while on-skates. You have limited time to train with your teammates on-skates, so I want to make the most of it. Do you have a favourite RDA workout? The All-Star Crazy Core Workout. It can be boring to focus on the core, but not with the variety this workout offers! Anything else you want to tell the world about your derby or training experience this year? Upping my mental training as well as increasing the quality of my off-skates training have really helped my get more out of my training in general, and also makes me enjoy derby even more! Congratulations to Maurine on a great year, and thank you for being a fabulous rep for RDA in 2017! We look forward to all the great things you will achieve on the track and in your coaching this season ahead.